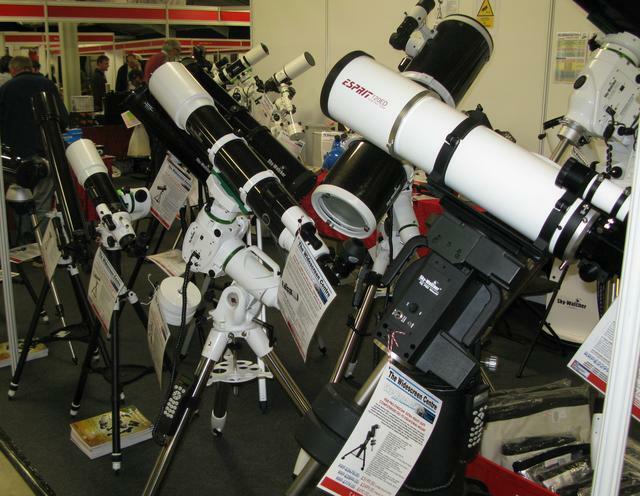 I’ve been to the big Astronomy show in Warwickshire again today. I go every year and it’s one of my favourite days of the whole year. 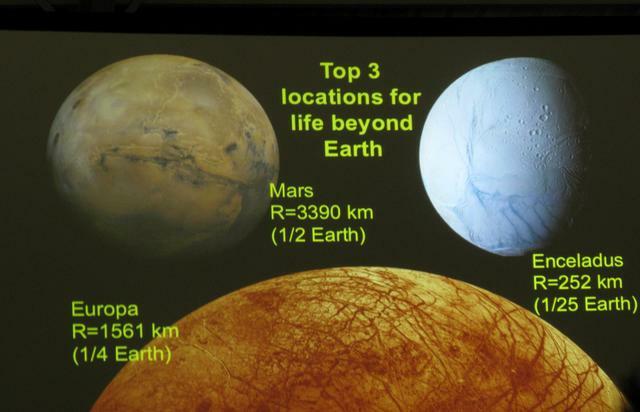 My favourite lecture was Andrew Coates talking about the search for life on Mars. He’s actually working on the space probe that’s going there in 2020. How clever is he? Check this out. Professor Andrew Coates gained a BSc in Physics from UMIST in 1978, and MSc (1979) and D.Phil. (1982) in plasma physics from Oxford University. 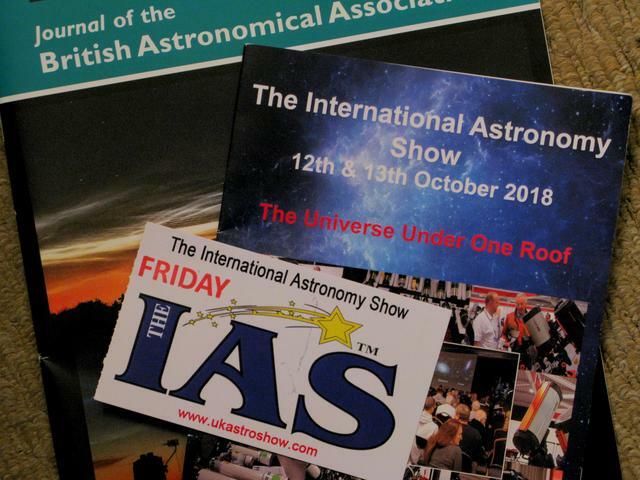 He has been at UCL’s Mullard Space Science Laboratory (MSSL) since 1982, with temporary positions at Max Planck Institute for Solar System Physics (Germany), University of Delaware (USA) and BBC World service (media fellowship). 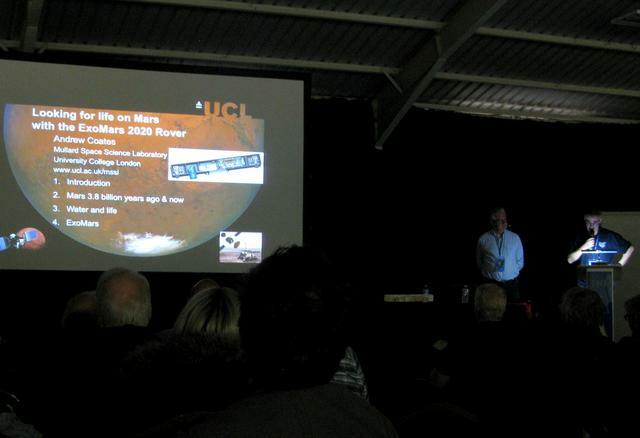 He is Deputy Director (solar system) at UCL-MSSL. Space involvements include the ExoMars 2020 rover where he leads the PanCam team, Cassini, leading the electron spectrometer team, Venus Express, Mars Express and Giotto. Here’s an observation report I wrote for the local society’s newsletter. Many times during the night we visited M31, and the best view came around 10.30pm through the ED80, when its companion galaxy M32 could be easily spotted, and the main galaxy itself was showing hints of structure. 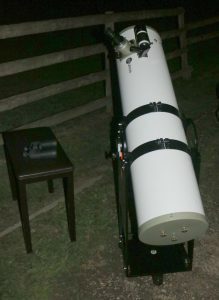 I can’t wait to get the society’s newly acquired 16” reflector on M31. Hopefully it won’t be too long.I’d been doing a lot of binocular observations over the summer, and M71 in Sagitta has eluded me every time. It should be very easy to find, the constellation is quite distinct and the object well placed almost between two stars, and Sagitta is right overhead. This evening, however, I was in luck, and we saw M71 in the 8” mirror. At first, we thought we were looking at faint nebulosity. Not so! After ten minutes, (and perhaps due to the dew on the eyepiece clearing), we were able to see it was in fact a quite dense star cluster. This was my favourite find of the evening, as I’d never seen it before, and I can understand now why there’s some contention about it being either a loose globular cluster, or a dense open cluster. I hope to visit it again under darker skies, it really is quite easy to find, as long as you have a clear enough sky and a capable telescope. The past month’s sky has been dominates by planets. I’ve been away in my caravan (above), so there’s no new planetary photos, (nowhere to charge batteries, being ‘off the grid’). And deep-sky stuff has been largely revisiting old friends with the 10×50’s and my 4″ Skywatcher ‘travel scope’, as I’ve come to think of it. Anyway, I’ve updated my Messier list. All of these objects in my list I’ve copied from observation notes. 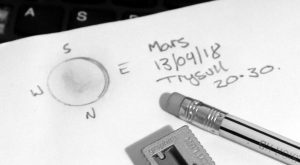 An ‘A’ after the object means it’s from a pre-2015 observation book (and therefore needs revisiting), and new additions are marked by a red 2018. I’m beginning to the Sagittarius is one of my favourite constellations. From my vantage point near Boscabel House, I’m able to get a fine view of it. There’s a great map of the area in the July 2018 Sky At Night magazine, (already out of date, Saturn has, I’ve noticed, has moved to the right of where it’s indicated in that map). Tonight’s deep space targets were the globular cluster M22, the Lagoon Nebula (M8) and the star cloud M24. These are easily found with the 10×50 Opticrom bins, but the Lagoon Nebula needs a scope to see the nebulosity well. The little 4″ Heritage performed admirably with a 20mm wide-field eyepiece. It really is a pretty star cluster with emission nebula. Whilst I had the 4″ on the van bonnet (true ‘grab and go’ astronomy! ), I looked for the Dumbbell Nebula (M27) and it was easily found. Cygnus is right overhead now, and the 15 minute drive out away from the city lights was well worth it, I could see the Milky Way easily by 11pm. I’m really getting on well with the red dot finder on the 4″. I easily found the Andromeda Galaxy (M31) and the more difficult Bode’s Galaxy and it’s companion, in Ursa Major (M81 & M82). 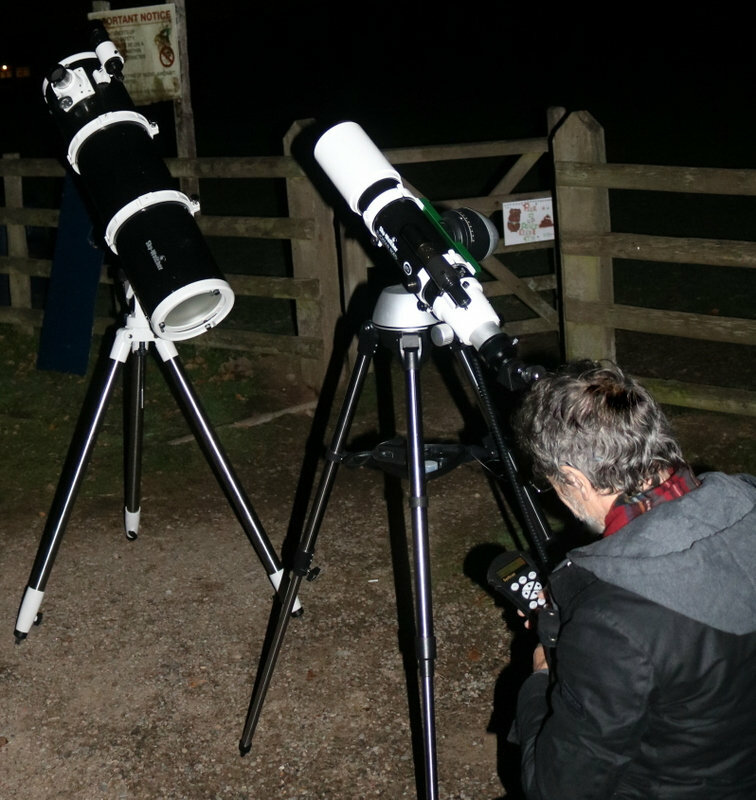 With its small focal length, it’s really low on ‘magnification’ with a 20mm eyepiece, but it’s obviously got the light gathering capacity to grab fainter objects, (the Opticrom binoculars couldn’t find Bode’s Galaxy tonight). The Opticroms did find the two great globular clusters of M13 and M92 though. The Moon was setting about 35% lit, waxing, with Jupiter to its left. 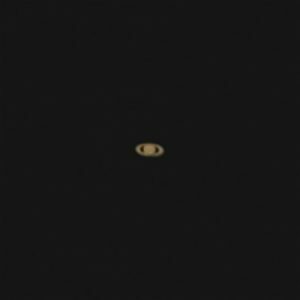 I arrived too late to get a photo, but I do have a picture of Saturn taken earlier this week that’s better than my previous effort. 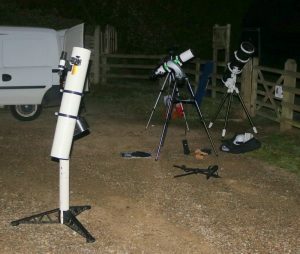 Though I’m beginning to realise that proper astrophotography might take more commitment than I’m giving it. The dust storm on Mars has cleared a little, and even through my clumsy DSLR/telescope combination, I can make out markings on the planet’s disc. I’m hoping the next entry will have some news on the observatory project. I’ve got some time off in the next two weeks, but the moon will be full in a week or so, so deep sky stuff might be off the menu. But when the winter’s here, I’m holding out great hopes for some hard-core observing through a 16″ mirror.